Machine mounted angle drives meet the need for take-off, where space does not allow a satisfactory layout of the flexible drive. Mounted on the end of a machine, or between engine block and radiator, they allow the flex drive to come in a smooth run towards the indicator and prevent vulnerable projections into gangways and access routes. Gear ratios of 1:1, 2:1 and 1:2 non reversing and reversing help solve ratio problems a more flexible approach to installation is possible by their use. 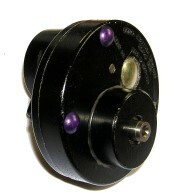 The angle drive mounts onto machine with 3 hole flange. Holes 4 mm I.D. on a 47.60 mm (1.874”) P.C.D. 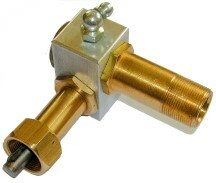 This accessory is made to fit on the flex drive end of an instrument. 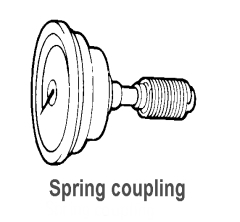 It provides a clockwise instrument drive for EITHER direction of input thereby producing a positive pointer deflection for both forward and reverse rotation of the machine. This gives twice the scale length to that of a centre zero instrument. This angle drive has a “Smith’s Key” (.292” dia.) fitting and ¾” x 26 TPI union nut to screw onto the machine, and a ¾” x 26 Male thread and Female key output to take a flexible drive cable. A number of ratios are available as are non-reversing and reversing options, output can be right hand or left hand. Used to take up small misalignments between take-off and instrument in direct drive systems. Three models are available, each with a maximum permissible speed of 6000 RPM.